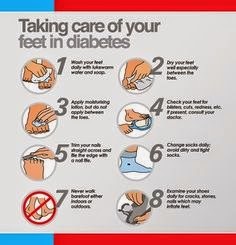 If you are a Diabetic you know how important it is to take care of your feet. If you did not know this, then let me explain why its important to see, either your podiatrist or a certified "Beauty Safe Salon" Aesthetician. Firstly, whats the difference between Type 1 and Type 2 diabetes. Type 1 diabetes is (formerly called juvenile-onset or insulin dependent diabetes) The body immune system destroys the cells that release insulin, eventually eliminating insulin production from the body. Without insulin, cells cannot absorb sugar (glucose) which they need to produce energy. Type 2 diabetes (formerly called adult-onset or non-insulin-dependent diabetes) can develop at any age. It most commonly becomes apparent during adulthood, but a number is rising in children too. In type 2 diabetes, the body isn't able to use insulin the right way. This is call insulin resistance, as type 2 diabetes gets worse, the pancreas may make less and less insulin. Diabetic Neuropathy - is an uncontrolled nerve damage to your legs and feet, this leads to not feeling heat, cold or pain. This lack of feeling is called "sensory diabetic neuropathy". If you do not feel a cut or sore on your foot, it may become infected. Also the muscles of the food may not function properly, because the nerves that make the muscles work are damaged. This could cause the foot not to aline properly and create too much pressure in one area of the foot. 10% of people with diabetes will develop foot ulcers because of nerve damage and peripheral vascular disease. Peripheral vascular disease affects the flow of blood. Without good blood flow, it take longer for a sore or cut to heal. If you have an infection that will not heal because of poor blood flow, you are at risk of developing ulcers or gangrene. Proper foot care can help prevent these common foot problems and/or treat them before they case serious complications. Take care of yourself and your diabetes. Follow your health care provider's advise. Check your feet every day for sores, blisters, redness and calluses. Wash your feet in warm water every day, using a mild soap. Make sure of the temperature wit your elbow first before you soak your fees. Dry your feet well, especially between the toes.If the skin on your feet is dry, keep it moist by applying lotion after you wash and dry your feet. Do not put lotion between your toes. Your doctor can tell you which type of lotion is best to use. Keep the blood flowing to your feet, put your feet up when sitting, wiggle our toes and move your ankles several times a day, and don't gross you legs for long periods of time. Make sure you contact your doctor for advise and treatment if you have any foot problem that are getting worse or not healing. Make sure your doctor examines you feet during each check-up. An annual foot exam should be preformed that includes an inspection of the skin, a check of the temperature of your feet and an assessment of the sensation of the foot. Finally and most importantly come and see Anita at Cameo Spa every 4 to 6 weeks for a pedicure. Massage feet and legs to improve circulation.